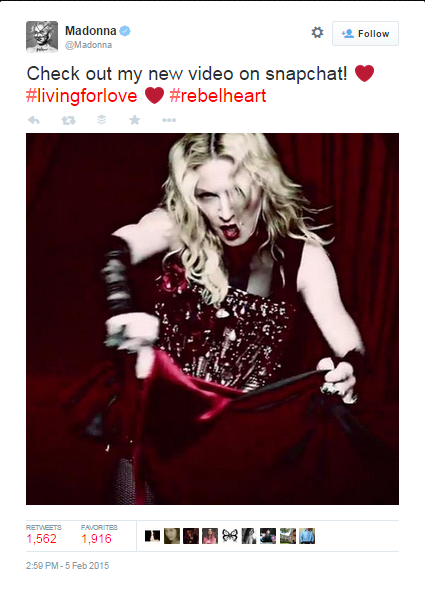 There was some interesting news in the music and tech industries this past week: Madonna previewed her new Living for Love video. Via Snapchat. Now, depending on your musical tastes, demographics and social media preferences, you may or may not have paid any attention to this headline. As one who is snugly nestled in that little generation between Baby Boomer and Millenial, I was intrigued by this. Partially because I have adored Madonna for as long as I can remember – I’m laughing while remembering the time I got in trouble for singing the lyrics to Papa Don’t Preach a little too loud-and-clear in front of my conservative dad – I was about 11 years old at the time and really didn’t understand what the song was about. If you remember that song, chances are you’re laughing at why it made my dad so uncomfortable! I’m also awed that she continues to put herself out there, blazing trails and being just so….Madonna. So, that brings us to last week’s video release. The decision to release her video via Snapchat was met with mixed reviews. Are you on Snapchat? Me neither. But my kids are. Do my kids care about Madonna’s newest video? Probably not. In fact, I don’t know that my 13-year old even knows who that is. So, releasing the new video through that channel was an interesting call. 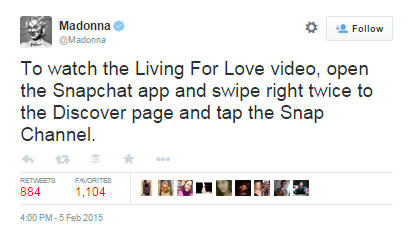 So, there must have been some feedback from people who had no idea how to use the app, so Madonna took it upon herself to act like Snapchat Tech Support and help them locate and launch the video. This tweet got me thinking about the situation, and reminded me how important it is to know our audiences when we develop and deliver workshops, training classes and other sessions. Friends, one of the most important parts of what we do is to ensure relevance, so our participants can carve out a meaningful learning experience to help them be more effective in their job today…or prepare them for wherever their career might take them in the future. To set the stage in our sessions (the 10% of 70-20-10!) for participants to carry the content out to the job, so they can apply it in the real world (the 70%!) and work with others to master the content and build context (the 20%!). Was the decision for an artist with primarily a non-Millenial fan base to release a video through a Millenial-heavy channel a risky one? Sure. Did it pay off? I think the jury is still out on that. Am I going to start Snapchatting now? Nah. But I can certainly appreciate the fact that technology is changing the way we do things and the way we learn. As learning professionals, we need to remember that – and like Madonna, blaze our own trails, continuously evolve, and shatter the status quo in our organizations. Your turn: What are your thoughts on how Madonna launched her new video? In your opinion, was it a hit or a miss? Share your comments below! Know of someone who would appreciate this post? Be kind and share it! Enter your email address here to get new phase(two)learning posts delivered to your inbox! This blog explores creative ways to engage and develop employees and drive tangible business results through onboarding and organizational development strategies. phase(two)learning is written by Michelle Baker. Michelle is a sought-after facilitator, author and consultant with 20 years of talent development experience.